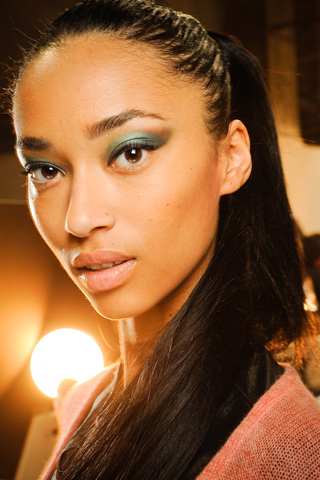 New York had a lot of fun makeup on the runway this season. Aside from red lips here and there, most of the runways had bare lips and dramatic eyes. Anna Sui used bright blue winged liner and under eye dots. Donna Karan went for eye emphasis with red eyeshadow. 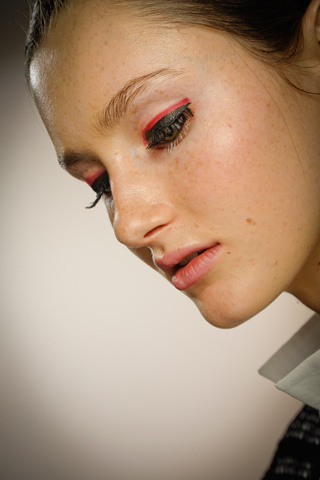 3.1 Philip Lim also used red in a stark line over thick liner. Jason Wu built up green cat eyes. L'ren Scott took a new spin on the smokey eye with navy rims. *Fact: We're committed to puns.